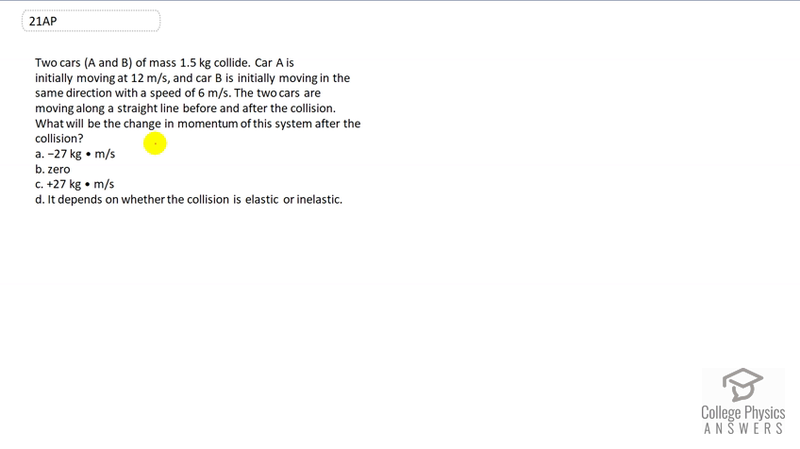 Two cars (A and B) of mass 1.5 kg collide. Car A is initially moving at 12 m/s, and car B is initially moving in the same direction with a speed of 6 m/s. The two cars are moving along a straight line before and after the collision. What will be the change in momentum of this system after the collision? It depends on whether the collision is elastic or inelastic. This is College Physics Answers with Shaun Dychko. Since there is no net external force acting on the system, it means that momentum will be conserved and that will mean that there is going to be no change in momentum of the system. You can take the momentum of each car, here is the initial total momentum, momentum of car A plus momentum of car B. Conservation of momentum means that after the collision, you'll have the same momentum. It doesn't even matter whether they stick together or not. So this is the algebraic way of saying momentum is conserved and that will certainly be the case in this question since there is no net external force. It's a closed system and the answer will be B. There is no change in total momentum.